Poison frontman Bret Michaels has once again told a solo audience that Def Leppard/Poison will tour together in summer 2014. You may recall he did this in both 2009 and again in December 2011 before the tours were eventually arranged and announced. At his solo show in Kansas City on 3rd July Bret told the crowd the bands would be back in 2014 to play the Sprint Center. A venue played during the 2012 tour on 27th June. 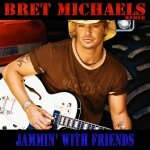 Bret is currently on tour promoting his solo album 'Jammin' With Friends' featuring Phil Collen which was released on 25th June. Def Leppard and Poison last toured together with Lita Ford opening on the 2012 Rock Of Ages tour. It's worth noting that each time Bret has announced a tour with Def Leppard (and indeed with Motley Crue) before the "announcement" - the tours have eventually happened. "The thunderstorm that preceded Michaels’ appearance undoubtedly dissuaded some people from attending the show. The poor turnout may have inspired Michaels’ repeated mentions of a 2014 concert at the Sprint Center that he said would feature his band Poison and the British band Def Leppard."